(Newser) – This is either great or horrible news for air travelers, depending on perspective: The FCC might soon allow passengers to talk on their cell phones all throughout their flights, reports the Washington Post. The agency will consider lifting its ban on airborne calls next month. 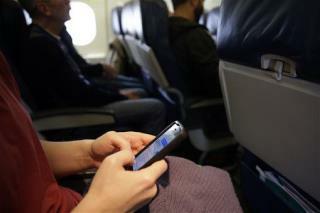 Under the proposed change, the only time phones would have to be off would be during takeoffs and landings. Once the plane reached 10,000 feet, the phones could go on. Worst idea ever…..only the asshats who already annoy everyone by: barging to the front of the line when the gate opens rolling a huge suitcase down the aisle and trying to cram it into the overhead launching their seats into full recline the minute they can will now also be squawking endlessly into their cellphones having inane conversations that everyone else squeezed into the plane will have to endure. I didn't think flying could become worse than it already is. It now will be unbearable. I'm thankful mainly due to my employer that I have a Hertz Platinum membership. I'm going to stretch the travel policy like a rubber band and go farther than the stated distance before we can rent a car just to avoid flying. Its going to be interesting watching the cellular providers deal with a communications paradigm they did not design, high altitude, 500mph communications. Thousands of planes in the air filled with tiny transmitters feeding signals through round holes in the side of the craft. Airplane cabins filled with hundreds of half watt transmitters that use electromagnetic law stating that RF energy is cumulative. I mean if a Tv transmitter has four 15KW transmitters the cumulative power input into the antenna system is 60KW. Then the antenna system gain directs it out to a field of energy in the 500KW range. You sit with all those half watt transmitters and I guarantee you if you fly enough, you'll have a huge jump in cancer rates.